We are a new small business located in Spring Hill, TN! Our store features custom-made, refinished, and up-cycled farmhouse decor. We make our own signs with vinyl lettering, offer wonderful, homemade natural soy candles, and we are a Premiere retailer of Dixie Belle Mineral Chalk Paint. We have all Dixie Belle paint products in stock all the time. 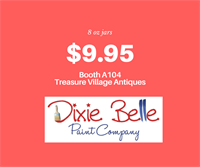 We will soon be offering a variety of paint classes so you can learn basic and advanced techniques using Dixie Belle, what fun!